As a group, ash (Fraxinus spp.) are common across the Lake Superior region. Three species are found here: Black ash or aagimaak (Fraxinus nigra), green ash or emikwaansaak (F. pennsylvanica) and white ash or baapaagimaak (F. americana). Black ash is often the dominant tree of northern hardwood and mixed hardwood - conifer swamps, appropriately referred to as "black ash swamps". It occasionally can be found in moist upland hardwood stands as well, in areas with clay soils. Green ash is typically found in wooded wetlands and along river floodplains, but sometimes also occurs in upland hardwoods. White ash typically inhabits upland forests, but sometimes occurs on floodplains. Together these trees make up as much as 20-40% of the forests of the Midwest (Rabaglia and Chaloux 2011). The Ojibwe tradition of basketmaking goes back centuries. Traditionally baskets were used for a wide variety of daily tasks, from picking berries to boiling maple sap to storing utensils to you-name-it. (That's right - as long as sap remains in the birch baskets and the baskets are kept above the flames, the birch bark stays cool enough to not catch on fire!) Baskets woven from black ash strips are strong, light and durable, and can be used for a variety of tasks. Traditionally the men of the tribe would perform the hard physical work of cutting down a black ash tree, removing the bark and pounding the trunk until the rings separated into strips. The women would then scrape and split the strips into smaller strips if needed, soak them until pliable, and meticulously weave the baskets. Over the years the number of skilled black ash basketmakers has dwindled. Recently, however, a resurgence has been taking place, with younger, dedicated tribal members taking up the skill. They are learning not only how to make baskets but also the stories and traditions surrounding basketmaking, and teaching others what they know. For a delightful story on one such black ash basketmaker and the art and craft of black ash basketmaking today (along with lots of great photos), see Emily Umentum's story, "Black Ash Basketry". Native to China and East Asia, the emerald ash borer was first discovered in Detroit, Michigan in 2002. It probably arrived in the early 1990’s, in solid wood packing material such as pallets or shipping crates. It has since spread to 26 states and 2 provinces, aided by movement of infested ash logs and firewood. It only attacks true ash trees (Fraxinus spp.). Unlike its ash hosts in China, North American ash species have little resistance to the EAB, and are usually killed within 3-5 years of becoming infested. By the way, people often ask if “mountain ash” (Sorbus spp.) are attacked by the EAB. The short answer is “no”! Mountain ash are members of the Rose Family (Rosaceae), and only very distantly related to true ash. The EAB is the most destructive forest pest ever introduced to North America. As of 2011 an estimated 60 million ash trees had been killed across the eastern US. Large swaths of ash-dominated forest in Lower Michigan, northern Indiana and Ohio now consist mostly of dead ash trees. And the beetle continues to spread. 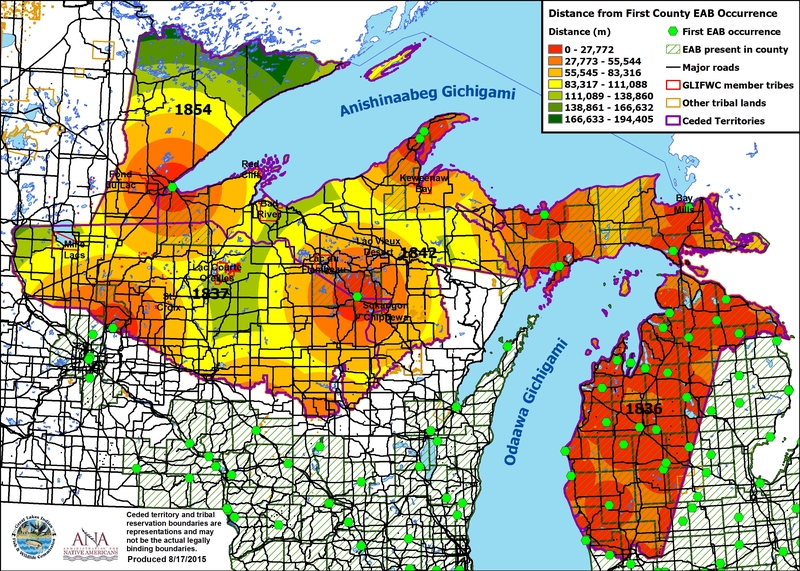 Factors contributing to the spread of EAB include ash abundance (see map above), distance to known EAB infestations, human population density, and distance to nearest major road. The reasoning behind the first two factors is simple – EAB can’t survive without ash, and is most likely to show up near where it’s already established. 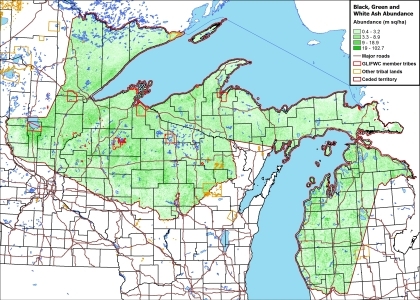 Human population density was chosen because the EAB seems to have a habit of showing up in cities and towns (most recently Superior, Wisconsin). Major road corridors are also associated with the long-distance spread of EAB. Along with facilitating transport of infested logs and firewood, recent evidence suggests that the EAB may rarely (but there are a lot of vehicles out there) hitch a ride on vehicles, even if they’re not carrying ash wood. 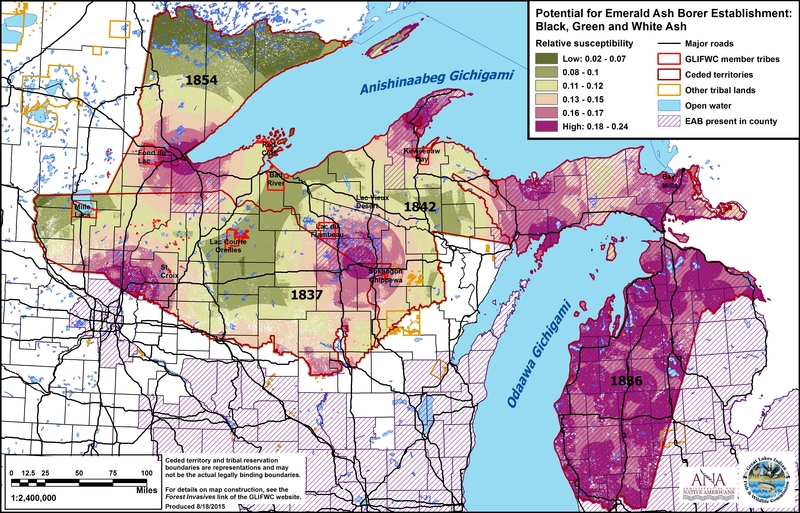 The resulting risk map for total ash susceptibility in the ceded territory is shown below. 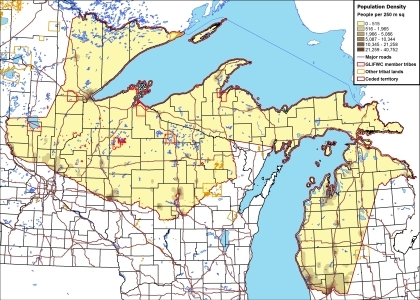 Counties where the EAB has been found are cross-hatched. Unlike previous maps, the region is more-or-less uniformly green (relatively high risk), with lighter areas in north central Wisconsin and far northeastern Minnesota, farther from known infestations. 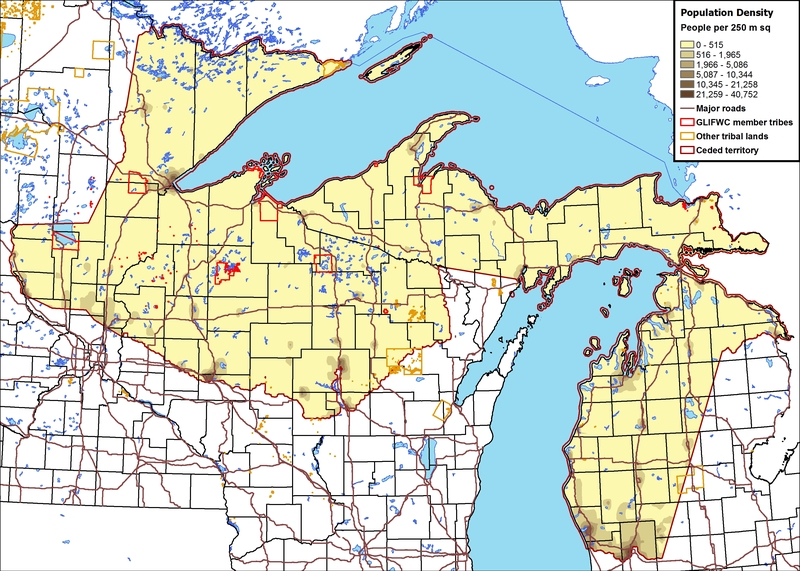 This susceptibility map shows predicted risk of infestation in the near-term, on the order of several years. The Akwesasne Task Force on the Environment (ATFE) works a number of environmental issues in upstate New York, including the EAB. See how the Mohawk Nation is dealing with the EAB. 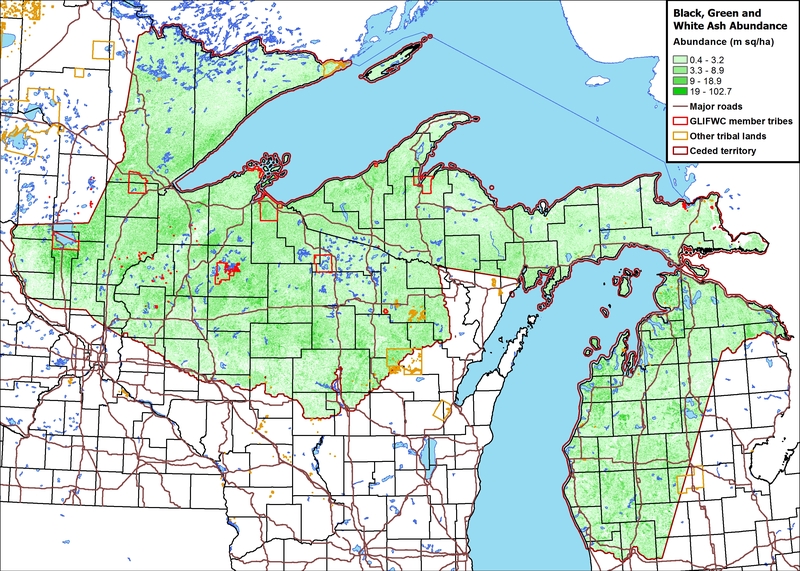 The starting point for information on the emerald ash borer in Michigan.